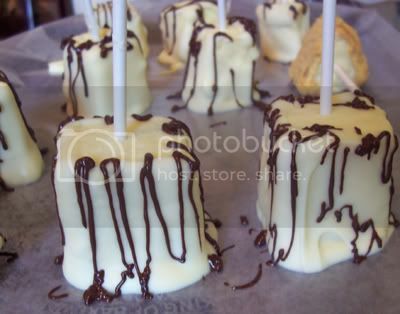 There’s cheesecakes, then there’s this month’s Daring Bakers challenge, Cheesecake Pops! 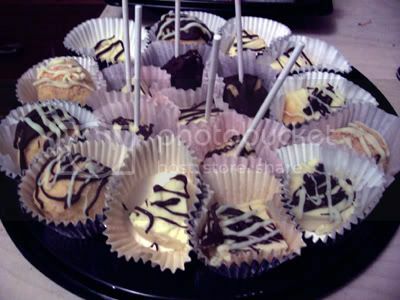 That’s right, these cheesecakes definitely pop as they are made into popsicle sticks. The girls loved these and they loved sharing it with their friends. I made this batch on my daughter’s birthday and she brought them to school as treats for her friends. This was also a great shared activity in the kitchen, so our pops turned out different shapes and sizes depending on who was making them. 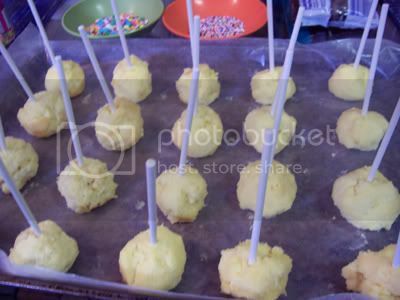 Then they (the girls) got lazy making balls and putting on popsicle sticks so they sliced the cheesecake into rectangles and triangles and had fun decorating them. Some were dipped in chocolate, some in white chocolate and then there were a few that were left naked and rolled in graham cracker crumbs. I am still experimenting with the baking itself, so I didn’t change anything from the original recipe. I tried to stick with the original as much as possible. I must say, for my first attempt at cheesecake, this turned out well. The only deviation from the recipe, and most other bakers also had the same problem, was that the baking time was extended to 60 minutes or longer. Thanks to Elle of Feeding My Enthusiasms and Deborah of Taste and Tell for hosting this month’s Daring Bakers Challenge. That looks like it is fun to make! I’m going to have to try it. This is fabulous!!! And you can “dress up” the cheesecakes according to party theme — whether it’s a kid’s party (fruits and candies) or an adult’s party (dark chocolate and truffles)… perfect. I love this idea! i’m so glad i made it here J! i will definitely try to be a daring baker for S’s birthday next week! i hope *fingers crossed* i make them as pretty as yours too!thanks! Thanks for your comments, everyone. This was a fun project to do. I can’t wait to make the next challenge! Yours looks so pretty and colorful, great job! They look great!! Wasn’t it fun?!?! What a wonderful way to get everyone involved! They’re so pretty! great to see you in on these DB challenges. these are such great treats for kids and kids-at-heart, aren’t they? your cheesecake pops look gorgeous. Your pops look delicious – I especially love the square ones. Your pops look so wonderful! Great job on this challenge! This is a great recipe for kids to help with. Nice job! 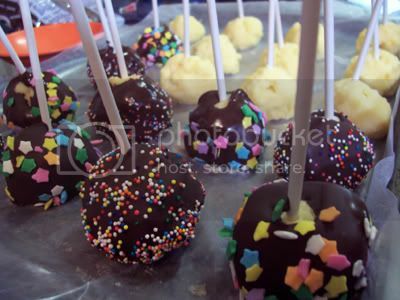 Beautiful, I love all the different variations and it looks like your kids had a blast with them. Glad you got to share the experience! It is always fun to share the challenge! Oh and they look lovely! Yum, they look so good! 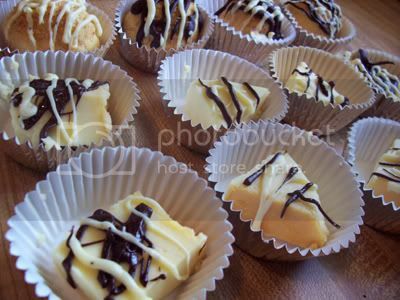 I love the drizzled ones! What a wonderful job you did, love your bright colors. I so need kids in grade school again, no teacher for me which means I might end up eating more than my share. Your pops came out amazing. I hope that your daughter’s class enjoyed them! We are bringing ours in for the teacher tomorrow!